You are here: Home / SEO + Inbound Marketing Blog / How to Write Good…Great Blog Posts! That’s right. This is a blog post about writing blog posts. It’s needed. Learning how to write good blog posts, and eventually how to write great blog posts, takes time and effort. The fact that you are putting yourself out there is commendable, so take a moment and pat yourself on the back. Alright, enough of that. Everyone, myself included, can improve. Always be the student. In this blog post about blog posts, we’re going to cover some of the common questions that people have about blogging, and provide some solutions and answers to improve your skills to better connect with readers, target customers…whoever it is that you are trying to attract. New bloggers often suffer from the one major obstacle: themselves. Whether it’s company updates that no one cares about, or addressing common industry topics from a “we we” standpoint, focusing on yourself and your own point of view is tiresome for readers. Your blog is not about you. It’s about your reader. Each blog post that you publish should be focused on your target readers’ point of view, their questions, etc. You must put yourself in their shoes and address the things that they want to know about. That’s how you connect with your reader. Everyone knows what it’s like to chat with someone at a party who only talks about himself or herself. It’s not fun to listen to. Don’t be that guy or gal. So, when you’re lucky enough to have readers, it’s important to keep their attention because…guess what? You’re one in a million…many millions, actually. There’s nearly 60,000,000 new blog posts published per month on WordPress alone (source). Everyone in the SEO space, including myself, is going to tell you to focus your content marketing and blogging efforts on keyword topics that people are actually searching for. That’s because we want you to be found (in search engines, especially) and to get results from your investment of both time and money. But, let’s take a step back. The only reason that keywords exist is because people have questions or needs that need answers or fulfillment. Search engine users’ queries are either transactional, navigational or informational. They’re going to Google (most of the time) looking for something to buy, a website to visit, or answers to their questions. Keywords are just the tool in their quest for what they seek. If you’re going to be their knight in shining armor, you’re going to have to do more than target the keywords that they’re using…you’ll need to answer their questions and provide the fulfillment that they’re looking for. We’ll cover this “question” approach further below…it’s very important. You can’t write about what you don’t know about…unless you’re a copywriter 😉 LOL, bad joke. Or is it? Seriously, I love copywriters (when they’re a good fit for the topic!). Most people who have some level of experience or expertise of their own on a particular topic can sniff out copywriting produced by someone who doesn’t have direct experience with what they’re writing about. That doesn’t create trust with your reader, potential client, prospective buyer, etc. A much better approach is to take the bull by the horns and write what you know about, so you can show your value…your expertise. You’ll leave a more lasting impact on your reader and everyone will be much better off! However, sometimes that’s just not possible. You may not have the time or the staff to produce content for your blog. In these cases, I would encourage you to ask yourself if that’s really true. You can’t find a way to carve out 3-4 hours each week to write one killer blog post? Are you busier than Richard Branson? He blogs nearly every day. If you’re really busy (aren’t we all? ), then pay someone to copyedit your blog posts instead of writing them for you. The content will turn out so much better, I promise. If it’s really not possible, then you need to find a copywriter that has experience in your industry. They don’t need to be industry experts, but they need to know enough about your blog post topics that someone on your staff can review and add a bit more detail (as needed) to ensure that the content will pass your readers’ sniff tests. Quality is everything. Without it, your just a tiny little fish in a big sea that is going to go unnoticed. Listen, you can make this as simple or as complicated as you want. I do both, because I’m…complicated. Just ask my wife. In all seriousness, you can do simple keyword research right within Google itself by using Google Suggest & Related Searches (<– read that post). Just search for topics that you know a lot about and are considering for your blog. Start to notice the trends in phrasing, synonyms, related terms, etc. That’s the simplest way to do keyword research, and you’ll have success with it (not every article, but you’ll grow traffic…I promise). What this approach won’t inform you of, however, is the estimated search volume for each keyword. For new bloggers without a lot of time and budget, that’s okay. This method will drive some results, and you should focus on your content quality and rate of content production more than anything (more on that later). If you want to kick it up a notch, sign up for a Google Adwords account and use Google’s Keyword Planner Tool. That will offer you some estimated search volumes, but don’t take this tool for gospel. The monthly search volume statistics are just estimates, and it can be hard to find long-tail keywords (such as questions!) that are awesome for targeting on your blog. I highly recommend that you check out Answer the Public, where you can get graphical insight into question-based queries that people use in search engines (example below). You can also export them and run them through Keyword Planner to get search volume. You can get more advanced with keyword research by “mining” the keywords that competitor pages are ranking for (and driving traffic from) by using a tool like SEMRush (affiliate link). For example, if I was a rocket scientist blogger who wanted to write an article about “how to build a spaceship,” and I really liked this competitor article, I could enter the URL into SEMRush and see the top keywords driving rankings and traffic. Pretty cool. The tool requires a paid subscription for full use, but if you blog frequently and have the budget, it could be worth the investment. Choosing keywords with the most search volume can be a dead-end strategy for new bloggers whose websites don’t have the authority it takes to compete in search engines for competitive terms. It’s important to consider your Domain Authority (a Moz metric) compared to competitors. You’ll likely know whether you have a very authoritative site or not, but you may want to compare your Domain Authority to competitors to get a better idea. Moving onward, the point is that you want to choose a keyword that you think you can compete for in the rankings. One of my favorite free ways to check competition is to use the “allintitle” approach, which will tell you how many pages that Google has indexed with the exact keyword phrase in quotes. You simply do a query like this in Google: allintitle:”<keyword>”. This method won’t tell you the competition on page 1 of Google, and it doesn’t account for how smart Google has become at understanding user intent of keywords (with less reliance on exact match keywords), but it’s still a quick gauge and something you can do for free. So, using the spaceship example, and using the keywords that we mined from the article that we liked, we can see the following competition levels for the three keywords with the most search volume in the screenshot above. Note: the numbers that you see in Google (after clicking the links below) may be a little different depending on what Google data center the search results are coming from, new content that’s been added, content that’s been removed, etc. After looking at these numbers, the keyword phrase “how to make a spaceship” is more attractive. It has good search volume and lower competition. The sites ranking on page 1 of Google for both this keyword and “build a spaceship” both have authoritative brands ranking, but our chosen keyword’s competition appears a little less stiff. Typically, try to shoot for less than 1,000 competing pages where possible. But, never let keyword competition completely determine what you write about or how you focus on your topics. Use it to fine tune. Pro Tip: If you have the budget, the Moz Keyword Explorer tool does an excellent job at measuring the ranking difficulty of keywords. It comes with a Moz Pro account, which offers many other useful SEO tools that you can use to grow your traffic. There’s something called “semantic search” that you need to be aware of when blogging. Google likes ranking in-depth content, and its algorithm has evolved to determine the level of semantic relevancy of your content to closely related topics. This is a sign of quality. So, when you’re blogging about a topic, you need to mention and touch upon closely related topics. This not only helps your content rank well in search, but it also will better engage your reader since the content will be more than a surface-level attempt to cover the topic. Using our spaceship example, you could simply search Google for “how to make a spaceship” and look at the bottom of the search results to find related searches. This will give you clues to related topics that people search for. Choose the ones that relate to how you plan to cover the topic, and even click on a few them to find more related searches. This is where you really understand how your target reader is searching for content like yours, which allows you to build semantic relevancy. You’ll build more semantic relevancy as you get into detail within your content, and mention specific entities and words related to what your topic. This is one of the most important aspects of a quality blog post, and I cannot stress it enough. Most of your blog posts need to be in-depth. They need to exhaust the questions that your reader is asking, to the best of your ability. By doing this, you will not only better engage your reader, but search engines will better value your content and likely rank it higher for the keyword topic that you’re targeting. Do you want to rank well? Let’s talk about how you achieve such content length and depth. The article titled, How to Blog Successfully About Anything, by Tanner Christensen, has left a lasting impression on me since it was written in 2013. It points out how important perceived questions are when blogging, and really gets you into the mind of the reader. The approach that I take is simple: write down 10 questions that you feel you reader is going to have about the topic…and answer them. This is the beginning of your outline. What’s the median single family home price? What’s the median condo / townhome price? Are real estate prices rising or falling in this neighborhood? What are typical property taxes? What nearby restaurants are around? What is the nightlife scene like? Can I afford a nice home or should I look at a fixer-upper? Is the neighborhood safe? What’s the crime rate? Are there any cool attractions nearby? That list took about two minutes to create. You can do this, and when you do, you’ll be writing from your reader’s point of view and also building the semantic relevancy that Google is looking for…and Google is likely to be one of your top traffic sources (if not THE top traffic source). Now that you have your list of questions, turn them into an outline in order to answer the questions and educate your reader. Your outline will (likely) become the subtitle structure for your blog post, which you’ll further expand upon as you begin writing the content. Using the 10 questions from above, we could have an outline such as the following. Note: (H2) signifies a “Heading 2” subtitle, however you can structure your subtitles however it makes sense within your content. More on this further below. You’ll notice that I used “Cherry Creek” in every subtitle. It may look a little spammy at first, but when you space out the subtitles with paragraph text, it will be much less noticeable to readers. Just be sure not to reference Cherry Creek too much in the paragraph text, or it certainly could look spammy. You could also limit the usage of “Cherry Creek” in the subtitles, if you think it will look more natural, but be sure to use this neighborhood name within the paragraph text under each subtitle in order to build up the keyword usage a bit. You don’t need to worry about keyword density, which is an outdated tactic, however use your keywords naturally as you see fit (without overdoing or under-doing it). Bottom line: use your keywords but don’t be spammy. Read it like a user would and ask yourself if it reads awkwardly. Fix it if it does. When we talk about on-page optimization, we’re mostly talking about optimizing your content for the keywords that you’re targeting. In order to optimize, you need to use the keywords (elegantly) within your content. Optimization is also about readability, however, and online readers don’t read…they scan. So, formatting is very important. Optimization extends further into imagery and other elements of your content. Let’s dive in. Your metadata is one of the most important elements of on-page optimization. The meta “page title” is what search engines show as the title for your page in their search results, and should be roughly 50-60 characters long in order to take advantage of full real estate in Google’s search results (without being too long and forcing the dreaded ellipses). The (key)words used in the page title have an impact on your ranking, so use them here. Just be careful not to repeat words. Take a look at the page title for this blog post, which is keyword-rich, not too short and also not too long. Notice how I also don’t include my brand name. It just takes up space and will be seen in the URL address of my search engine listing. Learning how to write good blog posts, and eventually great blog posts, takes some practice and shift in focus from yourself to your reader. Learn how! It’s critical to use subtitles. They give the reader anchor points as they scan the page to find what’s most relevant to their particular needs. Use subtitles (headings) in hierarchical order (H2, H3, H4, etc.). You typically won’t go past the need for H3, but you may have a need for H4 subtitles. This blog post is full of subtitles, so use it as an example. Use your keywords in subtitles. They have a little extra weight with search engines, just as they do with users, so put your keywords in this important format. Your paragraphs should typically be 3-5 sentences long. Again, this is to aid in readability since online readers are scanning (not reading). Paragraphs can go a bit shorter or longer as needed, but be mindful of your overall paragraph length. Also use your keywords here as well…where they fit naturally. When Google’s quality guidelines were leaked in years past (source), one of the quality factors that it asked its human quality raters to look for was something called “supplemental content.” They’ve since been removed from the (now public) quality guidelines (source) but I still think they are important. Where possible, create images with tools like Canva or work with a designer to customize stock photography. If you have your own images (photography, screenshots, etc. ), that’s preferred. Also be sure to provide short descriptive text for image “alt tags” and fill in the “title attributes” where possible in your blog posts. Search engines use the alt tags to identify what your image is about, and rank it in image search. Where relevant, find videos on YouTube to compliment your textual content. You can easily grab the embed code and enter it into your blog post. Don’t stop there, however. Today’s mobile devices come with powerful video capability. Pick up an inexpensive iPhone desk stand (like this one), capture your own videos an edit them with YouTube (which now has helpful video editing tools). I have to admit, I don’t do a lot of video, but I do embed YouTube videos where it’s relevant. Either approach will supplement your content with more engaging elements for readers. It’s my opinion that your grammar doesn’t have to be perfect…but should have style. It’s okay to break the rules (my opinion!) as long as you do it in an attractive manner to get your point across. Just avoid glaring mistakes. If you want, you can use a tool like Grammarly (which offers a cool Chrome extension). It’s helpful, but it will add quite a bit of time to your editing process. You could also read your blog post upwards from the bottom in order to help identify obvious grammar issues. Do your best here, as grammar is important to both users and search engines, but don’t sweat the small stuff if it has style. Wherever possible, implement calls to action within your blog posts. These can come in the form of contextually relevant, internal links to related pages on your site, attractive buttons that point to downloadable content, etc. Providing a “next step” for your reader will increase the chance that he or she stays on your site, and potentially performs an intended action (downloading an eBook, buying a product, filling out a lead form, etc.). There’s a lot that I didn’t cover, such as user-intent of keywords, getting readers for your blog, historical optimization, creating an editorial calendar or other aspect of writing a good blog. I’ll save that for a future update, or future blog posts 🙂 As mentioned in the beginning, always be the student. Always strive to learn and get better. Blog posts are your voice to your target audience, and the better you make them, the more they’ll work for you. Share the love! 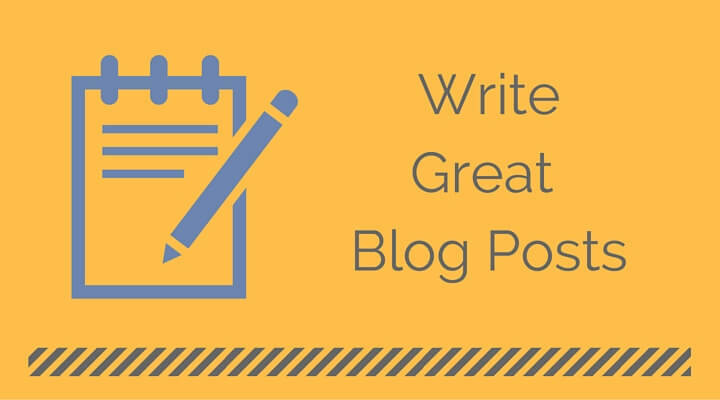 What do you have to offer about writing great blog posts? Please share your advice in the comments so we can all continue bettering our blogging skills.